In 1995, the Subaru Outback was the only off-road station wagon on the market and looked positively silly trying to outdo the two titans of the $1-per-gallon era, the Chevrolet Blazer and Ford Explorer. But its car-based chops and raised suspension — a look borrowed from the AMC Eagle — ushered in a crossover segment that swept all those truck-based SUVs into the forest. 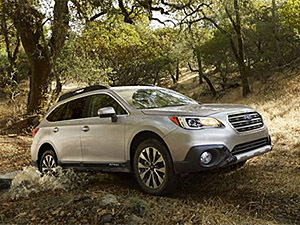 Now in its fifth generation, the Outback is still doing what it does best. It’s a simple, plain and durable family car that can take the hits and garbage roads that other crossovers can’t, without the style of a giant bubble. The 2015 Outback has more technology and luxury than ever before, which is a big deal for a company that has never tried to appoint its cars with anything fashionable. Heated rear seats, xenon headlamps, a power tailgate and a seven-inch touchscreen with voice activation, swiping motions and apps are all available. Subaru’s EyeSight camera system, which includes auto-braking, adaptive cruise control and lane departure warning, can now be paired with blind spot detection and rear cross traffic alerts for that extra degree of comfort. Such comprehensive features are nonexistent in the non-luxury segment, and Subaru has taken the lead. The all-wheel drive system is further enhanced with torque vectoring on the front axle and a new “X-mode” that optimizes shift points and switches on hill descent control for slowly navigating tricky downhills. The interior is roomier, the cargo floor is flatter, and active grille shutters on four-cylinder models make the Outback a little more aerodynamic at highway speeds. The engines haven’t changed, and while they’re sufficient — 175 hp from the 2.5-liter flat-four and 256 hp from the 3.6-liter flat-six — they could use more power. We’re also not happy the manual transmission is off the base models. Expect the first cars to arrive in June or July. Subaru won’t stray far from its $24,000 base price.